UPDATED, June 21, 10:50 a.m.: A manufacturing building on Staten Island was the biggest real estate project filed with the city last month. New Jersey-based developer Matrix Development Group wants to build a two-story Building On Gulf Avenue, which would be part of its 200-acre industrial park. 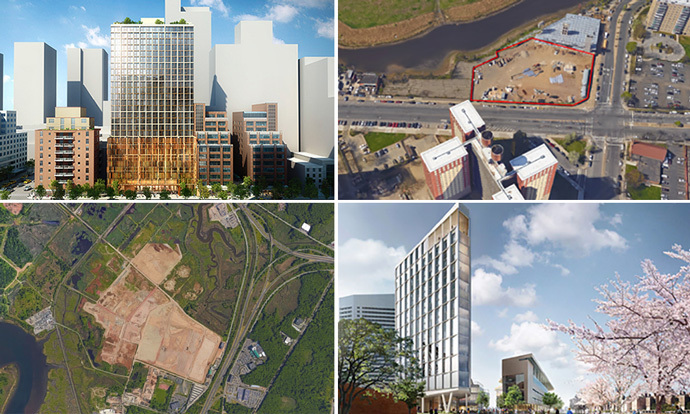 At 2.3 million square feet, it is May’s largest new project, according to The Real Deal’s analysis of Department of Buildings filings. There were no condominium projects filed with the DOB, and three out of the top permit applications filed last month were for hotels. A Coney Island car showroom also made the list. Matrix Development Group is planning a 2.3 million-square-foot commercial manufacturing building on Staten Island. The two-story building at 546 Gulf Avenue will have two mezzanine levels, and is part of the New Jersey-based developer’s Matrix Global Logistics Park, New York Yimby reported. The park, located in Bloomfield on the west shore of the borough, will eventually span 3.5 million square feet, according to the publication. The first two buildings are currently under construction. The 671-acre site was previously earmarked for a 82,500-seat NASCAR racetrack, according to a New York Times report. Cornell University filed plans for a 197-room hotel, which is part of the first phase of its Cornell Tech campus on Roosevelt Island. The 18-story building will span just over 139,000 square feet, according to a permit filed with the DOB last month. Norwegian firm Snøhetta is designing the first phase of the project, but the architect of record in the filing is Stonehill & Taylor Architects. 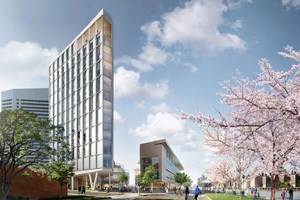 The hotel — which would feature function rooms, a fitness center and roof deck — is geared towards the families of students, visiting faculty and other Cornell guests, Curbed reported. Stretching roughly half a mile, Cornell Tech’s campus is set to feature a total of 10 buildings, including academic buildings, two residences, the hotel, a central utility plant and mixed-use buildings featuring co-working spaces and studios. The project’s first residential tower will be the largest in the world build to Passive House standards. The Arker Companies and Fountain Seaview One Housing Development Fund Corporation wants to build a nine-story, 129,068-square-foot building at 881 Erskine Street, according to a permit filed with DOB. The building is part of the Fountains, an eight-building affordable housing development in East New York, according to New York YIMBY. It would feature 144 units across 118,462 square feet. The building would also have 10,606 square feet of commercial space, the filing shows. Aufgang Architects is the architect of record. Three buildings will make up the first phase of the project, YIMBY reported. A permit application for another building at 702 Vandalia Avenue was also filed, according to the publication. Quadrum Global is planning a 20-story hotel with 353 rooms in the Garment District, although it’s a downsized version of the 500-key building the firm originally wanted to build. The plans, filed last month with DOB, call for a 122,127 square foot building buildings with 12 hotel rooms on the second floor and between 20 and 24 rooms on the remaining floors. There will be an amenity space on the ninth floor and a rooftop terrace. 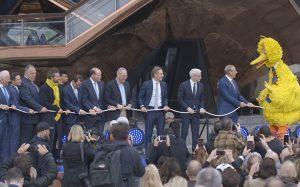 Marvel Architects is the architect of record. Quadrum partnered with Sam Chang in 2014 to buy the site for a combined $112 million, with plans to subdivide the property and build two hotels — one developed by each. Florida car dealer Manny Kadre filed plans for a new auto showroom in Coney Island last month, a permit application shows. The two-story showroom will span 77,487 square feet. Kadre purchased the lot for $14.5 million in 2015 from Storage Deluxe, a self-storage company. 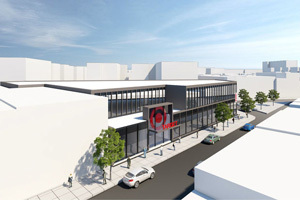 The building will also feature a car wash, rooftop parking, administrative offices and an auto repair center, according to last month’s filing. Bright Management is planning a 27-story hotel will 211 rooms, according a permit filed last month. The architect of record for the 59,134-square-foot building is Gene Kaufman Architect, who will be designing the building, DNAinfo reported. 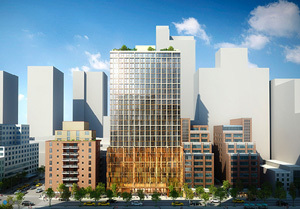 Development is slated for August, according to the publication. The Baptist Church of the Redeemer is planning a nine-story, 54,273-square-foot building at 1921 Cortelyou Road . The site is currently home to century-old church, Brklyner reports. The proposed building would feature 76 units and 7,619 square feet for a community facility, the filing shows. Edelman Sultan Knox Wood Architects is the architect of record. Sun Equities and Heskel Group are joining together to build a 46,858-square-foot retail building at the site of the Jackson Heights Cinema, which shut down in 2014. The partnership paid $27 million for the site last year. Target has signed up for a nearly 24,000-square-foot store in the building, paying $55 per square foot, according to the New York Post. GreenbergFarrow is the architect of record. An anonymous LLC based in Jamaica, Queens, wants to build a seven-story, 44,173-square-foot mixed-used building in Bushwick, according to a permit filed with the DOB last month. The application calls for 28,258 square feet of residential space, just over 6,000 square feet for commercial space and nearly 10,000 square feet for a commercial facility. The building will feature 41 units and a day care center for children over 6 years old. Because of an error, an earlier version of this story incorrectly included a mechanical building at Baruch Houses on the Lower East Side. In fact, the proposed building is not large enough to make the list.